We get a lot of questions about what is the best duty or defensive ammunition for your carry firearm. I really like to simplify this question for people and here it is: If the round does not meet FBI standard test protocols for Law Enforcement Duty Carry, (meaning it has actually been tested by the FBI and meets their standard), then it more than likely will not perform to the standard you want for defensive carry. Having witnessed several department tests on duty rounds and their performances on different barriers, I have several rounds that I prefer. One thing that I have noticed through testing on duty ammo, is the manufactures don’t bring any of their civilian production lines of defensive ammo. This says something to me, like those rounds are not going to perform like the FBI tested rounds. What is the FBI test Protocol? Well the FBI is looking at expectable penetration in barriers; including bare ballistics gel, heavy clothing, drywall, plywood, sheet metal and auto glass, of 12 to 18 inches in soft tissue, after passing through these barriers. Also, uniform expansion and bullet retention weights after passing through those barriers and impacting soft tissue. You should probably not be carrying anything else in your defensive firearm that is not listed below. Now there are several rounds that are not listed, that I would carry, as they are by trusted manufacturers and are the civilian equivalent of the LE/FBI tested rounds. I would say, you are safe if you carry any defensive HP round from Speer Gold Dot, Federal Tactical/ Bonded or Winchester Ranger T. as they are consistently listed. While there are round’s that say they meet FBI test protocols, these test are done buy the particular manufacture, who is trying to sell ammo to you. Before you decide to carry a round for self defense, research it and don’t just believe what the manufacturer claims the round will do. I personally will not carry any round in 9mm, .40 or 45 that is not from Federal, Speer Gold Dot or Winchester Ranger. Ammunition is constantly evolving and over the last 15 years great strides in bullet technology have been made. When new ammunition comes out, that claims to be better than all others that have come before it, ask yourself has this been tested by those who carry everyday and demand performance in all barriers? ATK is a defense company that the FBI usually awards contracts to for ammunition. ATK consists of Federal and Speer Gold Dot LE ammunition. In late 2012 ATK was awarded a 5 year contract with the FBI and DOJ to supply Speer Gold Dot. 40 cal and Federal 5.56mm ammunition. These contracts are revolving. In 2009 Winchester was awarded a large contract. Consistently over the past two decades, Federal, Speer and Winchester have been the awarded winners in testing and contracts, for a few of the rounds they produce , that meet the testing protocols. Currently the FBI is carrying 40 caliber duty firearms but a move back to 9mm has been rumored as round technology has advanced. It is rumored that new FBI Academy attendees are being issued Glock 17’s. This is following a nationwide trend of departments switching from 40 cal to 9mm. My former department switched from Glock 22’s to Glock 17’s last year and I have been seeing this trend with other department. Most recently Texas DPS switched from .357 Sig to 9mm. The list below is not all inclusive, but it gives you a large section of ammunition to look at. Several rounds have been tested by the FBI and have been approved for carry or carried by the FBI at some point. A few of the rounds below, may or may not currently be in production. The rounds below do reflect a large amount of independent testing (i.e. by LE Departments or Subject Matter Experts) not the manufacturer. I have personally seen extensive testing on Federal HST, Gold Dot and Winchester Ranger-T, in 9mm 147 gr, 40 cal 180 gr. and 45ACP 230 gr. This is why the three particular rounds are my personal choice’s in these calibers. Mas Ayoob has pointed out the FBIs emphasis on penetration. 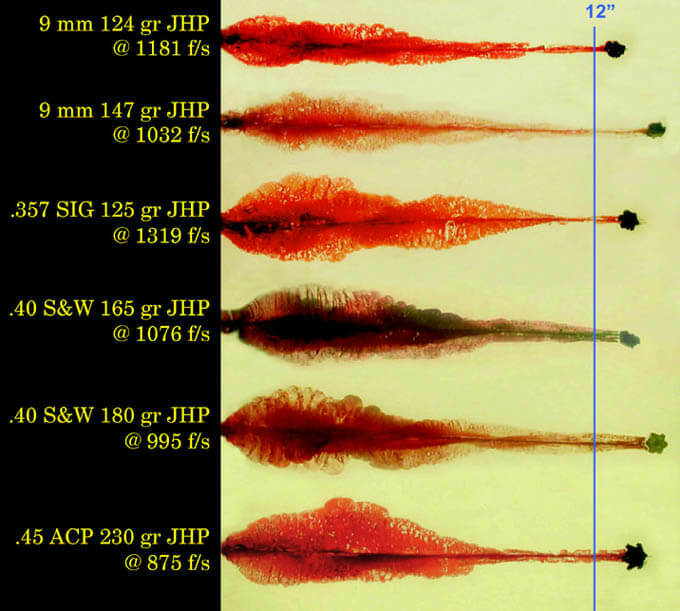 The 125 grain JHP 357 magnum and the 115 grain JHP+p and +p+ 9mm do not penetrate as much as the FBI require yet are the best known stoppers. You have to weight what is the best all around performer for what you my face. A CCW person and LE personnel will have different requirements. The average person probably does not need to defeat windshield auto glass, but the benefits of a bonded bullet, with good expansion and penetration after that barrier, is a better round to carry than something that has not been tested. I’m not into +p+ rounds. I think the standard loads in the highest grn available preform the best (i.e. 147 grn in 9mm, 180 grn in .40, and 230 grn in .45acp). Handgun rounds are inherently not really great man stoppers. These tests also only give you an idea of how the rounds may preform, not how it is going to preform in an actual shooting. A Lethal Threat needs to be immediately stopped regardless of the fact that a person is an LEO or a Civilian. It’s obvious that you have never worked in a High Violence areas; like Los Angeles, Chicago or in Border Areas. Both Police and Civilians carry firearms to deal with ANY Lethal Threat. Statements like yours need no be published. Note: I am a 25+yr LEO who is an NRA Certified Firearms Instructor who has taught both LEO’s and Civilians. I have also been involved in Firearms and Ammo T&E at the FLETC in Glynco GA.
Massad Ayoob is a believer of Marshall and Sanow. They believe in much shallower penetration and they have never presented proof of their findings that the 115 +P+ 9mm is the best. The human body also has bones that change things from the solid muscle simulant of gellatin. Also, don’t forget that if you hit an arm first, or at an angle you will need to penetrate more than the 10 inches many say is more than enough. regardless of what the FBI may claim I will stick to the .45 ACP and 10mm Auto myself. “The average person probably does not need to defeat windshield auto glass.” Something to think about, a friend of mine and our kids were at McDonalds letting our kids play while our wives were shopping. I hear a scream towards the front door. Somebody’s toddler was going out the door and the mother screamed. Got me thinking, I had a clear view of the door. But, there were 3 panes of glass between me and the door. In an active shooter scenario I could have a clear shot at the door, but I would need to be able to defeat the 3 layers of glass and still have enough energy to penetrate the intended target. Is the restaurant glass for dividers as tough as automobile glass? Probably not, but is is pretty tough. I’ve seen kids hit it and it not break. Plus that is 3 layers at angles. Yes, the benefits of having a bonded bullet go further then just Auto Glass. The modern duty bonded bullets tend to not have jacket core separation. This benefits you by retaining 90 percent or greater bullet weight after going through barriers and when hitting the target. All kinds of glass will have an effect on rounds fired. There has been a lot of testing on this. Bonded duty type rounds tend to perform/expand more uniformly. Adding all of this together, this means more energy is distributed into the target, for maximum performance. You lose nothing by having the best bullet you can get for defense. Even with a good bonded bullet, that would have been a near impossible shot. Bullets deflect even if they are a bonded bullet, and after going through 3 separate panes of glass, that bullet is not going to have enough energy to do much of anything if it even makes it through. That’s a tough situation to be in and there’s really no “good” way to handle it. You just have to do the best you can with what’s available to you and don’t give up. If you can’t stop the situation, try to get as much information as you can, ie, tag numbers, faces, what they’re wearing, ext. You folks are forgetting that only the first shot will be deflected. Follow-up shots, whether double taps or deliberately taken individual shots, will pass through where the glass has already been defeated. Several quicklt taken shots can still get the job done. If you are not LEO, I don’t think there is a good self-defense scenario to shooting through three layers of glass. Just protect yourself and your family. And if the BG is on the other side of the glass with your family, shooting through the glass could deflect the bullet to an unintended target/victim. I have seen a video on Youtube where a police sniper had to shoot a hostage-taker but his rifle round was deflected by the glass and missed the target. The criminal got enraged and shot several hostages before being killed by SWAT. A rapid second shot wouldn’t have been impeded by the shattered glass. My God, how could anyone in good conscience not act to protect someone else’s family as well as his own if he were in a position to do so? Sir, I believe that video was reviewed during one of our training classes at the Academy. If I remember correctly it was plate glass at an electronics store. The LE sniper was firing at an oblique angle to this tough glass. Yes, the glass deflected the path of the bullet. In LE training (FLETC) we are trained to compensate for this. BTW, bank glass is tempered and extremely tough. An improper bullet from .223/.556 may not penetrate bank glass even at a 90 degree angle to the glass if the range is extended. I’ll take .308 Win or 300 Win mag any day if circumstances warrant. I do not see Hornady listed here. Is there a problem? I have heard good things about their Critical Duty ammo. John, from what I understand the critical duty does perform better then the critical defense. As I stated, this is not a 100% inclusive article, but there are a lot of rounds listed that perform better then the Critical Duty/Critical Defense ammunition. Thank you. I read your page eveyday. I’d prefer their XTP hollow point line, which is proven. While I do not disagree with the overall point of the article, I have some issues. Note that I recently moved from a .40 to a 9mm for daily carry. As noted by others, the FBI studies focus on penetration, which other excluded studies differ with. Most of the 9mm listed are +P and heavier weight projectiles, whie the .40 are standard velocity. Is there really much difference in recoil from a heavy 9mm +P and a standard .40? Rick, yes there is a difference, the heavier projectiles tend to have a softer recoil. you have to understand that 40 cal is a high pressure round itself much like 357 sig. The heavier grain bullets also tend to perform better, ( 180 grn .40 and 147grn 9mm) I don’t shoot the +P 9mm loads, I think the standard pressure 147 grain performs the same if not better. As a former Vietnam Vet and police officer/detective, I probably carried and shot mostly everything under the sun. Your article was extremely informative and well written. The only thing that I can add from personal experience is that with 9mm rounds I have seen them ricochet off windshields and bad guys take multiple hits to the torso and keep coming. I have also seen a .45 make an exit hole the size of a silver dollar. Granted these experiences were a long time ago and before you stated that the ammo has been up graded. I shot a guy one time with a .38 lead 158 grain out of a colt detective special at point blank range after he cut me in the face with a razor. Damn thing hit him in the forehead, penetrated the skin, went up the outside of his skull and exited without penetrating the skull. Glad to hear the boys today have something that works. Being the old guy that I am, I’ll stick to my little new Glock 42 with Honaby Critical Defense. Nothing over about 10 feet anymore. If two rapid rounds to center mass and one to the head don’t work, I surrender. I know of a shooting in Canada where a Mountie shot a VERY vicious sociopath who had killed a kidnapped woman in cold blood. The thug was hit with two 158 +P SWCHP rounds, brand unknown but probably Winchester. One did almost exactly what you describe here and bounced off his head, the other was an elbow area hit and was the more “serious”. End result? Offender died years later of cancer, but should have been dead before he hit the ground. Larry, see my post below. We were issued Federal 9mm 115 JHP +P+ 9BPLE, and found it expanded too fast from the HK MP5 (8.85″). It worked well in handguns. We switched to 124 gr Gold Dot as it performed well in both pistols and SMGs. We made the change after our chief spoke with a San Diego PD lab-type. Don, I use the 9BPLE also for daily carry. Did you guys notice any difference when you used them in shorter barreled pistols in the 3-3.5″ length range vs 4-5″? I’d be interested in your opinions of my ammo choices, because I’m not switching to a semiauto. The gold dots are probebly gtg. The hydrashoks are very old technology. I would upgrade to a modern Federal load for their replacement, like the HST if they offer it. AFAIK, Federal does not yet have HST for 38spl/357 caliber, but their Hydrashok are still gtg. I myself use off-brand 125gr 38spl +p JHP on my Ruger SP101. Yes, I it should say 180. .357 magnum: Barnes XTB All copper 140 gr. HP or Speer Half Jacketed FP 170 gr. .45 ACP: Federal HS 230 gr. +p JHP Or Speer Golddot 230 gr JHP +p.